San Francisco, CA— A show which reunites on a single night at seven top magicians, (only six were presented on opening night) each one with the showmanship of the great illusionist of the past, has to be magic. THE ILLUSIONISTS- LIVE FROM BROADWAY was. 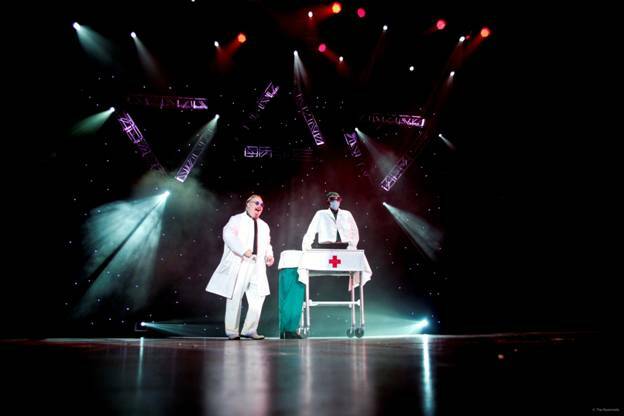 Described as “The Best-Selling Magic Show in Broadway History” it debuted in S.F. on February 16th at the SHN Orpheum Theatre in the city. At the end of the show, the audience, who filled every seat on that night, was delighted. What collectively, these six magicians had presented to us on the stage: illusions, levitations, mind readings, disappearances, escapes, was pure Magic. We all love Magicians because they can turn dreams into reality. A good Magician always creates a sense of wonder in people.. A great Magicians enchants his audience That night, all did. Magic is not about tricks, it is about a person being able to transform something that looks “simple", into an experience. And what experience we all had on that night! The show began with DAN SPERRY – The Conjuror, described in the press kit as "Marilyn Manson meets David Copperfield." His act was a combination of the Art of Magic with the macabre. On that night he shocked everyone, by literally pushing a quarter inside his right eye socket and then extracting it by slashing his left upper arm with a knife, inflicting a bleeding wound on it, and then extracting the quarter from the slash. BEN BLAKE, - The weapon Master, showed us his complete mastery of the crossbow, by slashing the strings of three helium-filled balloons standing in a row, with a single arrow shot, by cutting a thin sheet of paper with another arrow, and by desintegrating in pieces an apple that he had placed on his own head, while standing in from of automatic crossbows placed on the stage which could be triggered all at once, with the gadget that he was holding in his hand. The tension in the act, was created by the fact that a bandana was covering his eyes, as he stood in front of all these arrows pointed at him, and he had to calculate the arrows target (the apple on his head) by listening to the sound of a bell on the stage, as he pulled a string, which indicated to him the direcion of the arrow in each one of the automatic crossbows. The escapologists, ANDREW BASSO, is Italy’s scape artist. He started his career as a magician but turned into Escapism because of his fascination for “danger.” As student of the “Magical escapes” of the world's most famous Escapologist HARRY HOUDINI (l874-l926) BASSO can now perform two of HOUDINIS’ most famous escapades: 1) HOUDINI’s Water Torture Cell, an escapade from a tank filled with water (while hanging upside down with both his hands in hand cuffs and his feet in chains, which he did not do on that night) and 2, HOUDINI's escape from an straight jacket with both his arms and hands constricted behind his back and hanging from the ceiling by his feet. BASSO escaped from his jacket in a few minutes, simply by wiggling his body back and forth. JEFF HOBSON – The Trickster, was a charming Master of Ceremonies, who kept the audience laughing as he performed a series of “magic tricks” which included “reading minds” using deception for laughs and calling different members of the audience to the stage as helpers. His best trick of the night was placing a plastic egg on a cotton bag and make it disappear while a woman from the audience was holding the bag on her hands. HOBSON left the stage asking the woman to continue looking for the egg in the bag. She did, several times, but the bag was empty. As HOBSON mingled with the audience, while walking in the isles of the theatre. the egg appeared inside the bag. The woman was surprised. HOBSON returned to the stage, and we all laughed because when the woman handled him the plastic egg, in exchange, handled the woman her wrist watch, he had removed from her wrist. JAMES MORE – The Deceptionist, presented an unbelievable number in which he lays down inside a crystal cage. The cage is closed with a crystal top, and after closing it, his helpers start lighting candles and placing them over it. They cover the cage with a cloth and silhoutted inside the cage we se see MORE’s body twisting from the pain of the intense heat produced by the burning candles. Suddenly, with the weight of the candles, the top of the cage collapses on top of MORE. As we all expect him to be flattened, by the weight of the cage's top, his deception, surprises every one of us. 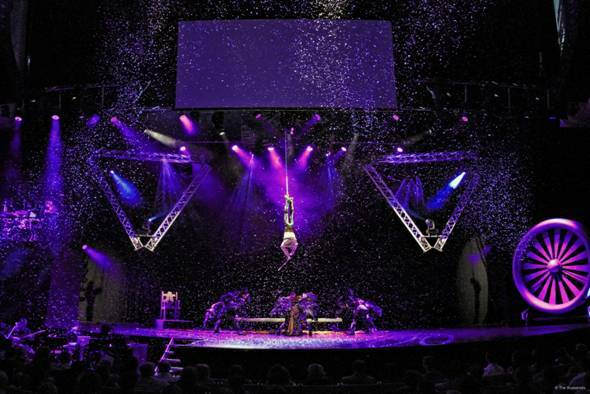 The ILLUSIONISTS, Live from Broadway, produced by creative theatrical London’s producer SIMON PAINTER is a show for people of all ages. It is funny, It is is entertaining and it shows magic as its best. Tickets are available by calling SHN Audience Services at 888-746-1799 (Press 2) or shnsf.com.